Hip Hip Hooray! This is my 50th post! I realize I am probably making this into a bigger deal than I should, but to me it IS a big deal. So what should I write about for my 50th post? Hmm… How about a weekend recap? With Pictures? Sure! Well Friday after work, I picked up Gavin from his dad for a rare occasion. He spent the entire weekend with us! We hardly ever get to have him an entire weekend! Since Gav is on spring break this week, we decided to kick off spring break with a BANG! Friday night we watched the Tennessee Men play Michigan in the Sweet 16. Do not get me wrong, Trey and I like basketball. It just isn’t something we usually watch on TV. Tennessee put up a good fight. It was kinda hilarious to watch Gavin pace back and forth through the living room in the last minute of the game. In the end, Tennessee lost. We resumed regular activities after Gavin picked his broken dreams of a National Championship up off the floor. Saturday morning we woke up to the yuckiest, rainy, gloomy weather. We didn’t let it stop us though. We piled into the car and headed out on a road trip to Chattanooga. We began our road trip with a stop at Chick-fil-a for some breakfast. When we arrived in Chattanooga, we stopped by the Tennessee Aquarium. We went to the Atlanta Aquarium a few years ago, so since that time… all other aquariums look like glorified fish tanks to us. Atlanta spoiled us. The aquarium was fun though. After the aquarium, we grabbed some lunch then found us a hotel for a quick nap. After our naps, we ventured to the local mall to blow some money and get some exercise. Later on we found a hole-in-the-wall Mexican restaurant for dinner before heading over to the movies. Sunday morning began with breakfast at Cracker Barrel. Our hotel had a continental breakfast; however, we were RIGHT ACROSS THE ROAD from Cracker Barrel. You can’t be right across the street from Cracker Barrel and eat a hotel breakfast. It is just un-American to pass up Cracker Barrel. After Cracker Barrel, we punched the address to the Chattanooga Zoo in our GPS. First of all, who knew Chattanooga had a zoo?! Second of all, why was this kept a secret?! The Chattanooga Zoo is pretty fantastic. I actually liked it better than the Nashville Zoo. If you are ever in the Chattanooga area, you should definitely add the Chattanooga Zoo to your list of must sees. All in all, it was a fun weekend. It was exciting to get to spend 2 whole uninterrupted days with Gavin. I usually only have him half a day on Sundays and Monday and Tuesday after work. It really isn’t much time at all when you really think about it, so we try to do the best with the time we DO have. 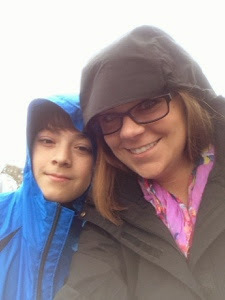 I can’t blog without mentioning our infertility journey! It has been 9 days since our IUI. We have 11 more days until we find out if this cycle worked. Ahhh… I’m hoping we can stay busy and distracted so the next 11 days will fly by! I’ve been feeling a little…umm… weird the past day or so. I’m hoping these are early pregnancy symptoms and not the beginning of a strange sickness! 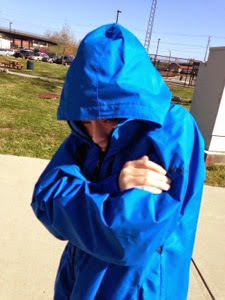 Gavin freezing at the Chattanooga Zoo. 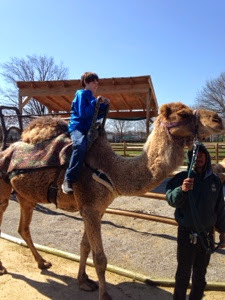 Gavin riding a camel… and LOVING it! 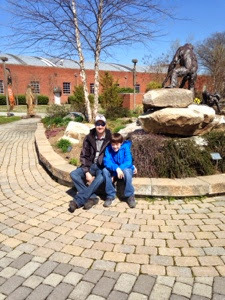 Trey and Gavin at the Chattanooga Zoo. 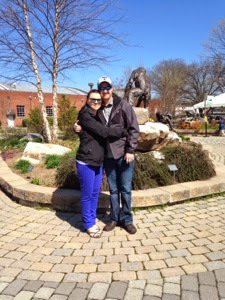 Trey and I at the Chattanooga Zoo. We had our IUI 6 days ago. I woke up 10 minutes early this morning so I could take my Ovidrel injection out of the fridge to start “warming up” before my husband had to leave for work. So this morning at 5:45am my husband gave me one last more injection in the belly. I hope and pray with all of my being that our sweet little miracle is digging a nice little comfy spot in my womb today. We are not supposed to take a HPT until the 11th. That falls on a Friday. I’m not fully convinced I would be able to hold myself together at work all day if I see another BFN after everything we went through this cycle. I think we will wait and test on the 12th. That way we can both be together all day to cry or rejoice. Maybe. We also plan to keep the results our little secret until after NFC has released us back to our OB/GYN. I’m not sure I will even tell people then though. I want to be 110% certain we have a little sticky bun in there who is along for the ride before I go around shouting “I’M PREGNANT” from the rooftops. Oh and believe me. There. will. be. shouting! So happy Friday to everyone! Cross your fingers and say your prayers for me these next few days. The next 2 weeks will be the longest ever. 1.) My wonderful husband injected Follistim into my pin cushion of a belly 5 nights. He injected Ovidrel into my bruised and sore belly yesterday. It was so romantic. Not. 2.) We had our 1st monitoring appointment yesterday. 3.) I will never be able to express my level of thankfulness and gratitude to God for the blessings my husband and I watched unfold yesterday at NFC. Are you ready for this? I. HAVE. A. MATURE FOLLICLE….AND MY LINING IS WONDERFUL. That’s right. We’re still in the game. I had a small 13mm cyst on my left ovary last Friday, but by God’s mighty power, the cyst had “dissolved” in a week. I have ONE BEAUTIFUL, MATURE follicle. All glory goes to the Man above who has heard all of our pleas for a healthy lining and NO cysts! We realize we are one step closer to bringing home our precious miracle(s). It is amazing watching God’s plan slowly unfold before my eyes. I’m so thankful for the road we have traveled and the doctors and nurses who have given us encouragement as we wait for our miracles. God is so good. I feel like I cannot say that enough. A year ago I decided to break my silence. I decided it was time to share the extremely emotional journey I’ve been on since 2006 when I lost my baby. I wanted to share my journey for the sole purpose of maybe finding someone out there in either blogger land or Facebook who either needed me to support them or they could support me. I have been extremely blessed by the number of women (and even men) who have reached out to me since I laid every, single, personal detail out there for the entire Facebook and Blogger world to read. I have had people wrap us up in their prayers. I have had people offer words of encouragement. I have had people cry with me. I have had people rejoice with me. I have also formed a relationship with a handful of amazing, strong women who know EXACTLY how I feel. They understand how frustrating it is to be “out this cycle”. They have scars on their bellies from surgeries just like I do. I do NOT have a single regret for opening up about my journey. I do regret letting the negative people tear me down though. I had a woman- whom I have not spoken to in YEARS- tell me felt she couldn’t share her pregnancy happiness on her Facebook because of me. Let’s pump the brakes a minute here. I am surrounded by baby bumps, baby shower invites, babies, and pregnancy announcements. I am HAPPY for each woman who does not have to endure the pain, frustration, or disappointment I have been through. Did you catch that? I said I AM HAPPY FOR THEM! I have held so many babies over the past eight years. I get a little teary-eyed holding newborns from time to time, but that’s about it. I’m aware of my limits. I know what throws me into a downward emotional spiral, and I know how to avoid those situations. Part of dealing with infertility, is learning how to deal with being around super-fertile people. It happens. It’s life. Just because my reproductive system has forgotten how to function, does mean I’m suddenly overwhelmingly angry AT pregnant people, nor do I want someone to feel like I’m trying to overshadow them by sharing my own journey. Let me make this crystal clear so I do not step on any toes. I’m happy for those who are able to share the joys, excitement, and happiness of pregnancy with their spouses, friends, and family. I’M HAPPY! At the same time, I still hope and dream of having that same experience with my husband. There is nothing wrong with that. So many times I have had people trample tell me I should not feel that way and I should be thankful for what I already have. Yes. I am thankful for everything I have. Not a day goes by that I do not thank God for giving me my amazing husband, home, job, and Gav. I’m a woman. It is natural for me to want to be a mother. Now that we’ve addressed that elephant in the room…Let’s move on. Shall we? Yesterday, I felt it was necessary for me to enjoy the evening by going for a run when I got home. So I did. I rushed straight to my bedroom to change my clothes as soon as I got home. I tied my running shoes and took off around the neighborhood. It felt beyond amazing. I usually listen to music to help pass the time and encourage me while I run. Yesterday I shuffled my “Recently Added” play list. The very first song to play really caught me off guard. I do not think I had heard the song before. I’m not even sure how it ended up on my iPhone. Regardless, I listened to it on repeat for my entire run. I needed to hear these words…. over and over and over again. What’s a sad hole? Well it is what my therapist referred to as my hopeless, sad funk I tend to get myself into from time to time. I did everything she told me to do to try and pump the brakes and STOP myself from the downward spiral into the ugliest depression ever. I really did try. I failed. Back to this sad hole thing. On Friday I was fine. I was slightly exhausted and really wanted some pizza, but other than that, I was fine. Cue Saturday morning. I woke up, put my workout clothes on, and headed outside. I had every intention of going for a nice, long run. The weather wasn’t exactly perfect. I didn’t feel 100% amazing. I tried to make the best of the situation. It didn’t work. One mile into my walk-jog-not-quite-run, I decided I just wasn’t feeling it. I walked back home feeling a little defeated. That began the downward spiral. I cried at the drop of a hat most of the day Saturday and ALL day Sunday. I felt like I didn’t belong. I felt like I didn’t fit in at church since I’m not expecting. I don’t have a small child. I’m divorced from my 10 year old’s dad, which means 75% of the time, I’m unable to participate in the mother/son fun events at church. I’m not sure WHY the divorced thing has crept up on me and suddenly started bothering me again. It has been almost five years since Gav’s dad and I chose to go our separate ways. This isn’t something new I’m dealing with, but for some reason it has started bothering me in the past few days. Weird. One of my least favorite things to hear when someone is attempting to comfort me is this…. I realize there are women who have never and will never experience pregnancy or childbirth. I know I’m blessed to have received the gift of a child ten years ago. I also know I want to share the joys of pregnancy, childbirth, and so on with my husband. I want to raise a child WITH my husband. I want to give my husband one of the greatest gifts… a child of his own. It has become pretty evident in the past few years, my chances of carrying another child are slim. If you need a quick refresher on what started this journey, you can read my blog post from April 2013. We are almost at the end of our assisted reproductive technology journey. It is time to grieve and pray for God to comfort me. It is time for me to accept the fact my body is giving out and the dreams having a biological child with my husband may never come true. I have to be okay with not having a baby Bell. I am thankful God gave me three pregnancies. I have one precious child here on Earth and two precious angel babies waiting for me in heaven. I have so much to be thankful for, but at the same time I’m so sad. This is not the end. My husband and I are in agreement we will pray for Baby Bell until we feel the Lord is leading us to live the remainder of our lives together without Baby Bell. My husband is still confident God will hear our pleas for a child and we will have a child. I’m to the point I do not want to get my hopes up. It seems every time I am positive with high hopes, I get crushed. I’m almost numb to this process. I have no idea what cycle day I’m on. I don’t even care what day I’m on. I just know I have to have a period in order to get pregnant. I know I can’t have huge cysts on my ovaries. I know being in this sad hole isn’t going to get my prayers answered. At the same time, I just want to be sad.